The beautiful Copperband Butterfly fish has bands of gold and orange with black edges. Known for controlling nuisance pests such as Aiptasia, the Copperband has a long narrow mouth for feeding where most fish can’t go. Also unmistakable, is a large spot or false eye towards the tail of the fish. It grows to about 8 inches in a reef aquarium and is considered difficult to keep. Copperbands have been known to be finicky eaters and during the acclimation period. Various types of food should be given to entice feeding. They also have a tendency to pick at inverts and anemones. There have been reports of them occasionally nipping at LPS corals. They are peaceful for the most part, but will fight with their own species and or fish of similar shape and color. Copperband Butterfly fish prefer a calm large reef aquarium. 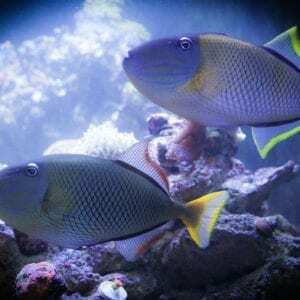 This fish has also been known to jump during stressful situations so peaceful tank mates is a must for optimum health. They also require pristine water conditions. In general, much like many dwarf angelfish species, it’s hit or miss with regards to their personality. 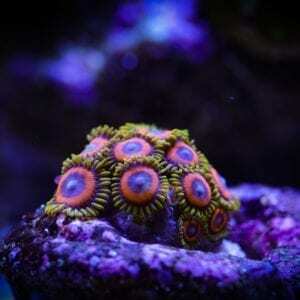 Some are perfect reef inhabitants. Others will nip at corals. They should be monitored regularly for destructive behavior.